A high school dropout, Aftab Ahmed impresses with his fluent English and dapper appearance. Till less than a year ago, he was a 'driver' and now introduces himself as a 'businessman'. In reality, he is a car driver for Uber, earning close to Rs 50,000 a month, a far cry from the Rs 15,000 he earned earlier. His motivation came from friends who had become 'rich' by working for taxi aggregators, and this required him to buy a vehicle. Strapped for cash, the erstwhile chauffeur for hire had neither collateral nor guarantor to seek a bank loan. That Uber had a tie-up with a company named Capital Float came as a big relief. "I had to sign a simple form; didn't have to pledge any collateral or provide a guarantor. The down payment required was low, which helped me purchase a car and sign up on Uber," says Ahmed, elated. Srinivas Mothey, Co-founder of Suviro E-commerce, a gifting solutions company that sells custom bobbleheads, jewellery and other bric-a-bracs on e-commerce platforms, was faced with a similar situation. Suviro was looking for working capital to expand its business and the response from banks was discouraging - conventional banks demanded audited balance sheets of several years, plus property as collateral, which were hard for a company set up only in 2012 to furnish. Capital Float's "innovative and vendor-friendly" approach appealed to him. "They perfectly understood the e-commerce business. They knew our potential and were willing to support us." The Bangalore-headquartered online-only lending platform for small and medium enterprises was started by Stanford classmates Gaurav Hinduja and Sashank Rishyasringa. "The goal of Capital Float is to offer flexible short-term loans that can be used to purchase inventory and service new orders to optimise cash cycles. Borrowers apply online, select desired repayment terms and receive funds in their bank accounts in three days, all with minimal hassle," explains Rishyasringa, its co-founder. The third generation scion of the Hinduja family, which built Gokaldas Exports, Gaurav had seen suppliers and vendors struggle with financing. "We wanted to do something meaningful and impactful, leveraging the power of technology. Fintech was the obvious choice. Sashank, with his understanding of finance, capital markets and management consulting, and I, with my India experience, brought in complementary skills," says Hinduja, Co-founder of Capital Float. They identified that SMEs were borrowing close to $150 billion per annum from moneylenders and other informal sources. Also, SMEs wanted easy-to-get, collateral-free loans. However, their plan for an online lending platform to disburse loans quickly without collateral was met with scepticism. "Investors said SMEs are not tech-savvy. Since there is no collateral, they were wary of how we would recover the money," Rishyasringa recalls. 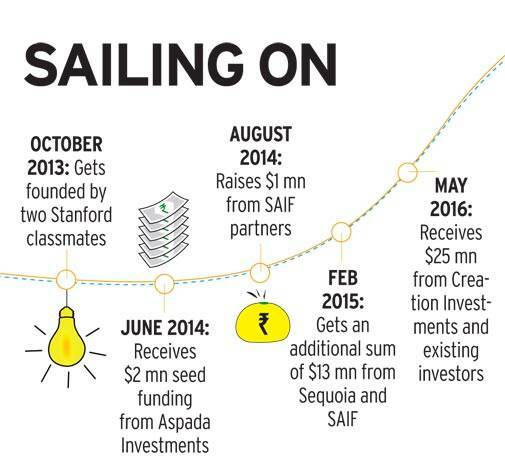 Two and half years since its launch, Capital Float has the answers. 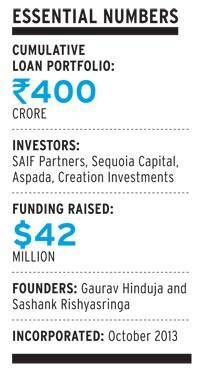 The NBFC, today, has a loan book of Rs 400 crore, operates across 40-plus cities and has raised $42 million, cumulatively, from the likes of SAIF Partners, Sequoia Capital, Aspada and Creation Investments, in three rounds of funding. Surprisingly, it is also partnering with conventional banks to take on debt and lend. "The current branch-led model of banks makes it unviable for them to lend small loans. Because we are an online-only lender, our cost of processing is infinitesimally small compared to banks. So it makes sense for them to partner with us as lending to the SME sector also qualifies as priority-sector lending on their books," Rishyasringa explains, refusing to disclose the names of the banks. The company claims it was one of the earliest to work with aggregators such as Snapdeal, Paytm and Uber to enable suppliers and vendors get instant online loans. "We look at their track record on the platforms, sales cycles, bank statements, and RoC and MCA data, if available. We also rely on psychometry and social media to decide on whom to lend. Our secret sauce is a unique blend of tech and data," Hinduja says. Capital Float lends amounts ranging from Rs 25,000 up to Rs 1 crore. The turnaround time (from loan application to disbursal) varies from 15 minutes to a couple of days. "This is significantly lower than that of a bank or a usual NBFC. Our aim is to be faster than the moneylender, but without that extortionate rate of interest," he adds. The interest charged is between 16 and 19 per cent. It has an Android app on which 85 per cent of the documents can be submitted. For mandatory requirements such as KYC and legal documents, it has an offline footprint, too. With 250 employees at present, the company is unlikely to hire more people as it would remain technology-led. "Unlike most other start-ups, we are profitable at a transactional level," claims Rishyasringa, though he refuses to divulge the average cost of funds, citing confidentiality. The company claims that its NPA levels are less than 1 per cent over the 32 months of its existence; perhaps a function of its small loan book. "The current NPA issues of large banks, too, are not coming from SMEs, but from large players. SMEs are largely family-and entrepreneur-driven and are, thus, careful. Even in microfinance, if you look at smaller loans, the default rates are very low and that has been our experience too," Hinduja says. MCA data for the year ending March 31, 2015, indicates that Capital Float had total revenues of Rs 1.4 crore and net loss of Rs 2.2 crore. Patrick Fisher, Managing Partner and Founder, Creation Investments, which participated in the company's latest round of fundraising, lauds Capital Float for the scale it has achieved. "SME lending represents an underserved and growing market opportunity in India. By leveraging technology, Capital Float has built a differentiated model that is able to deliver credit to the smallest of businesses in a scalable and efficient manner."